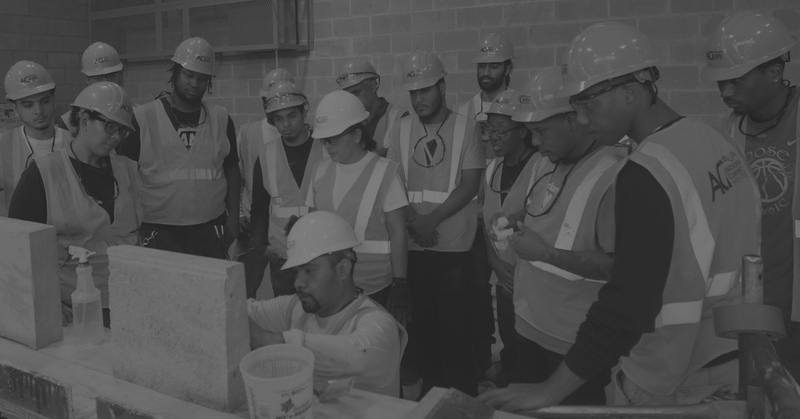 The Masonry Restoration Program focuses on developing core, hands-on skills, as well as educating students on the necessary safety and compliance measures set forth by the Department of Buildings (DOB) and The Occupational Safety and Health Administration (OSHA). Hands-on training is taught on simulation façades utilizing real masonry materials under the guidance of instructors who are active in their area of expertise. The theoretical portions are taught by ACI’s certified instructors in the program’s designated auditorium and classrooms. During the program, all students receive free OSHA, Suspended Scaffold, Supported Scaffold, Respiratory Silica, and Fall Prevention training courses. The restoration industry is driven and regulated by NYC’s Local Law 11/98, known as the Façade Inspection Safety Program (FISP). Owners of buildings of six or more stories above-grade must have their exterior walls and appurtenances periodically inspected and repaired. Due to the weather conditions in NYC, there is constant wear-and-tear to the building stock, requiring restoration work to be done regularly. The legal mandate combined with the weather conditions make this a virtually recession-proof field. The men and women who perform this work serve the City of New York. ACI runs training programs to help them grow into the next level of their career. Brings workers in contact with skilled craftsmen who can guide them in hands-on technique. Available only for workers with demonstrated management potential, these programs teach the skills of the foreman, super, or qualified safety professional. Workers begin in the field as a generalist, eventually developing expertise. A worker can also get promoted and be the manager of other workers while being responsible for their safety and the execution of the project. Former laborers make the best supervisors due to their field experience.